Quinn Sullivan lost the love of her life when her boyfriend, Trent, died in an accident their junior year. In an attempt to get closure, she reached out to the recipients of his donated organs. Though some answered her letters, the one Quinn feels matters most–the person who received Trent’s heart–has been silent. Nineteen-year-old Colton Thomas has spent the last several years in and out of hospitals waiting for a heart transplant. Now that he’s finally received a new heart, Colton is regaining strength, and he’s walking away from his bedridden past with no intention of looking back. He doesn’t want to know about the person who had to die so that he could live. He only wants to move forward. But Quinn can’t let it go. Venturing outside the system to find Colton, Quinn takes a risk in hopes of finally laying her memories to rest. But what begins as an innocent conversation quickly becomes an attraction–and to make matters worse, Colton has no idea how they’re connected. His zest for life pulls Quinn from her months of sorrow but leaves her torn between honesty and utter betrayal. Because no matter how hard she’s falling for Colton, each beat of his heart reminds her of all she’s lost. I have tears in my eyes, so forgive me if my words might blur together. What you’re reading now is, after all, a puddle of feelings threatening to either choke or warm my heart. I’ve said it before, I’ll say it again, Jessi has this incredible power for breaking my heart down into tiny little pieces and building it back up again, in a better shape even. And that’s such a wonderful feeling. I can hardly explain it, I can barely describe the amount of happiness I felt bursting from my heart when I picked up this book, but please know that this story is totally and utterly beautiful, sometimes in such an aching way, sometimes filling one’s heart with so much delight. There is grieve, there is love, there is hope, there is happiness. Jessi can create the most romantic and lovely moments ever, also the deepest and the most heartbreaking, leaving you truly breathless and making your heart skip quite a few beats on the way. If you fell in love with her other stories you will simply adore this one! It was all that I wanted.. everything I hoped for, and my expectations were actually sky-high. Her best so far! 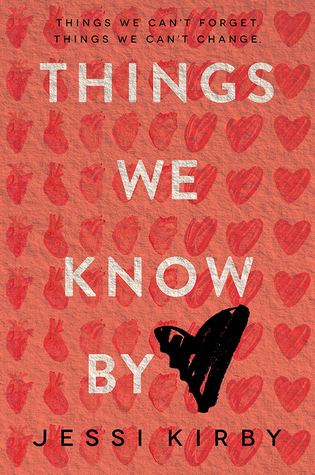 To be honest, “Things We Know by Heart” made me cry from the first chapters and then there was so much more emotion and .. life hidden inside this story, and so much cuteness and beauty that it made me dizzy (that or the fact that I didn’t have a proper lunch, as I kept glued to this book – and if breathing would have been optional I would have given up on it too, my heart would’ve been beating just fine for this story alone). Really, reading this book felt like falling in love, with the ups and the downs, with all the passion and the fears; it was like stepping over the edge and jumping without knowing what I could possibly find below.. I braced myself for the heartbreak, but I didn’t anticipate the immensity of the love I would actually experience. Without knowing it, Jessi has created in this story scenes that I dreamt about, or things that I hold close to my heart, or places I would love to visit and things I’d like to do or see for myself. She has created characters I would love to meet someday and beautiful, intense love(s) that could never die. 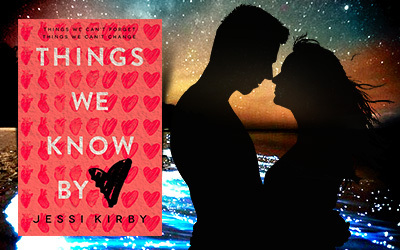 “Things We Know by Heart” was emotional, but also romantic and fun! Quinn and Colton are sensational. There is a lot of pain in their lives, plenty of secrets, of insecurities, or regrets. But they both need love and a new beginning. Neither of them knows how to put their sorrow into words, to say just how sorry they are, and for some things even grateful, but they’ve been broken and reshaped by life in such a way that they fit perfectly, in every way. I loved how crazy and clumsy their first meeting was, I loved how they couldn’t stay away from each other from that point on (though Quinn struggled and the truth was killing her inside), I loved how they used every opportunity to have the best days ever, together. The sweetest even. And it’s not only the couple, but their supporting families are just as great. His sister is so caring and cautious; her parents and sister and grandmother so open and fun.. and grateful to see her start living again. I won’t say anything about the storyline because it’s way too early and I am not much into that anyways. For me what counts is what a book makes me feel, and this one managed to make me feel plenty and all soooo very good! The writing is beautiful and lyrical and I have tons of quotes that I love from the bottom of my heart. As Quinn says, I wish I would be able to keep these feelings in a bottle, to have them and remember them forever. It is perfect, guys, this book is absolutely perfect! There are feelings I could never, ever, not in a million years, put properly into words. And there are books like “Things We Know by Heart” that make my heart beat twice as fast and that remind me of how precious life really is, how imense my love for reading gets with each day, with each book, and also how incredibly talented authors like Jessi Kirby can really be… Believe me when I tell you, Jessi, that you are simply amazing! And these are all… things I know by heart. Early review: Advance copy provided by the publisher for review. I thank you deeply! Oh, I’ve been reading some tragic and beautiful books these days that I can understand how incredible this one will be. I’m so glad it was that great. I read Golden because of you and I can’t wait to read this! I trust Jessi Kirby with my heart. All her books were perfect for me and I would read everything from her – I bet that she can make even a shopping list to seem fun and emotional, LOL! Such a beautiful review, Ari! How can I keep calm now, huh? I don’t know, as I’ve been anything but calm,LOL! Woww, if your words take my breath away I don’t know what this book might do to me. Beautiful review, Ari! Thank you, Sandra, I think you might love it just as much, as it is a beautiful, heartwarming story. This is my most anticipated book in 2015 and your review makes me so much more anxious, I simply can’t wait for it! This review is absolutely beautiful, I can feel how much you loved this book and it makes me so happy. Thank you! Enjoy all your college years and don’t worry, there will be also time for pleasure readings 😉 Hope you’ll enjoy this book just as much as I did! This one sounds so great I can’t even think about the waiting. I want it badly. It was sweet and heartbreaking and beautiful and.. oh my, I love it so much! Can’t wait to get my hands on a physical copy! Beautiful! Can’t wait to get my hands on this book now!!! It is a lovely story. I can’t wait for everyone to read and love it! This is my absolute favorite book!!! OMG it is AMAZING if you haven’t read it yet, you need to! <3 Wow! Good work, Jessi Kirby!